A research report analysing the success of London Schools, commissioned by CfBT and carried out with the Centre for London (2014). Analysing historic quantitative socio-economic and performance data relating to schools across the London region. Conducting, coding and analysing interviews with Head Teachers and experts in the field, including Dame Sue John, Sir Tim Brighouse and Sir Michael Barber. Triangulating findings to draw conclusions on the lessons to be learned from London Schools’ success. 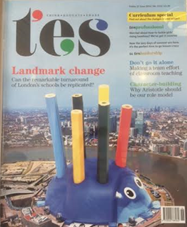 Contributing to and securing coverage of the report, speaking on BBC London radio, writing for the National Governors Association’s publication, and securing front page coverage of the TES.